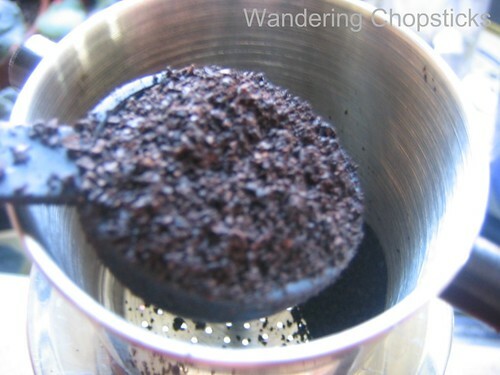 There's no greater pick-me-up than watching a deeply rich brew slowly drip through a Vietnamese coffee filter. Vietnamese coffee is meant for lingering. Chat with a friend, eat your bowl of Pho Bo (Vietnamese Beef Noodle Soup), or watch people go by while you wait for your cup of coffee to finish brewing. The slow drip, with no paper filters to absorb the coffee beans' essential oils, results in a thick, strong, bitter brew. 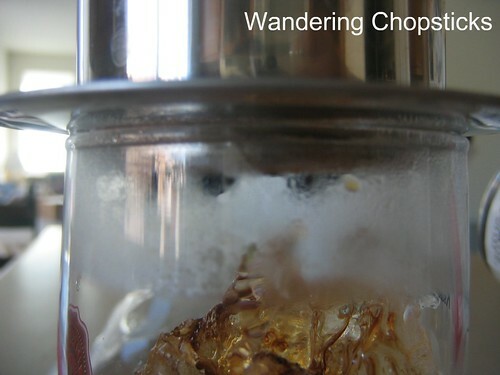 Enhanced by condensed milk, more easily stored in the humid tropics, which serves as both sweetener and creamer. Poured over ice, it becomes a chilled refresher. Coffee was introduced to the Vietnamese by the French in the 19th century. Nowadays, Vietnam is one of the world's largest exporters of coffee. 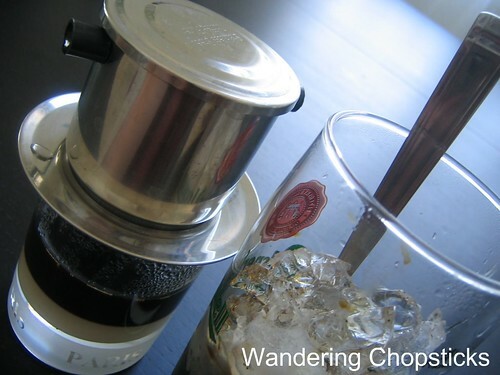 Making cà phê sữa đá (Vietnamese milk coffee iced) or cà phê sữa nóng (Vietnamese milk coffee hot) isn't difficult, but it does take very specialized ingredients and tools. Consider this a basic primer on how to brew and make the perfect cup, or I should say glass, of Vietnamese milk coffee, iced or hot. 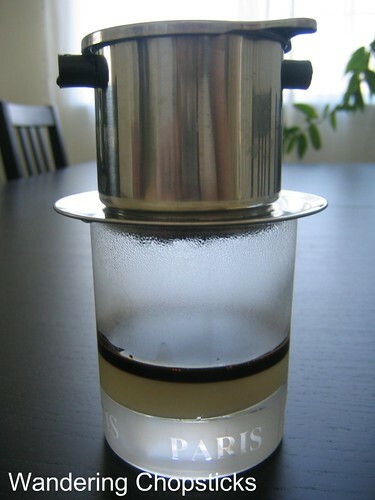 A Vietnamese coffee filter brews one single cup of coffee. It comes in three parts, the main central brewing pot, a lid (which also doubles as a coaster), and a mini plunger. 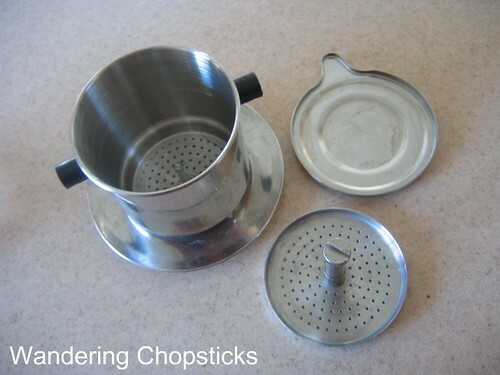 The principles are the same as a French press, except sized for one. If you plan to make this for more than yourself, plan on one filter per person. 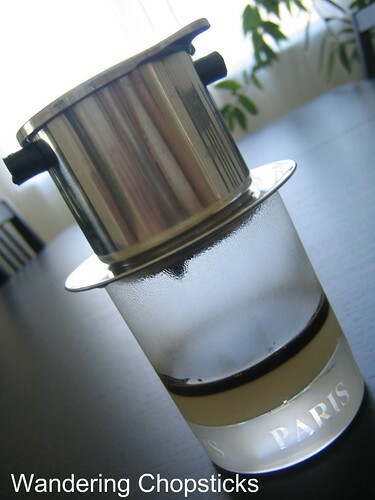 A Vietnamese coffee filter can be found at most Vietnamese, and possibly pan-Asian, grocery stores. It should cost around $3. The other essential ingredient is condensed milk. Some people swear by certain brands, Longevity with the little old man is quite popular. Just read the ingredients list and make sure only milk and sugar are listed. 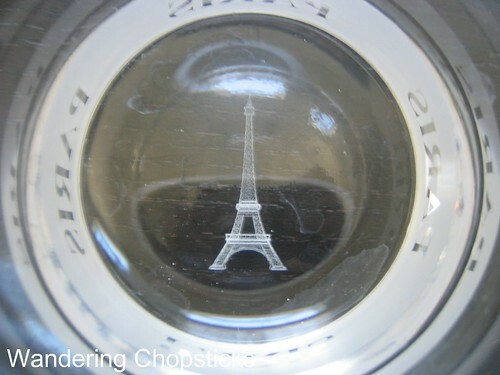 Isn't it apropos that I used my Eiffel Tower souvenir glass for this? It looks like a small glass, but trust me, a little goes a long way. Think of it as the caffeine equivalent of a tiny cup of espresso. 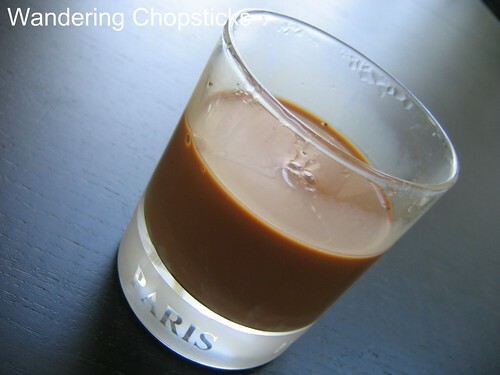 Vietnamese coffee is a blend of several beans with arabica and robusta the most popular. Trung Nguyen Coffee is as ubiquitous in Vietnam as Starbucks is here. (Try Vietnamese civet coffee at your own risk.) The Vietnamese American adaptation and preference is for Cafe Du Monde's French roast with chicory blend. If neither of those options are available, at least make sure your coffee is coarsely ground. Now you can pour the boiling water into the filter. Tighten the plunger more if the coffee seems to be dripping too fast. It should only be dripping one or two drops at a time. I just use the tip of a butter knife to tighten the plunger. Put the lid on top and wait. See the coffee brew slowing dripping down? While the coffee is dripping, fill a taller glass with ice cubes. When the coffee is finished brewing, flip the lid over and it now serves as a coaster to hold the filter. 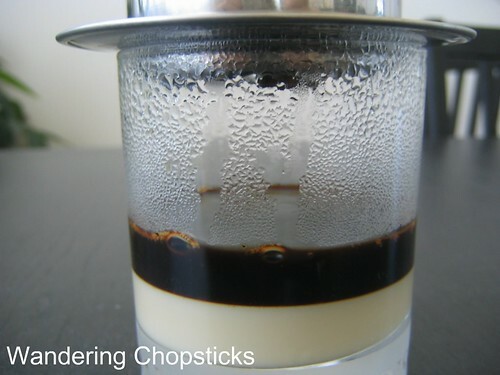 Stir the condensed milk and coffee and you have ca phe sua nong (Vietnamese milk coffee hot). 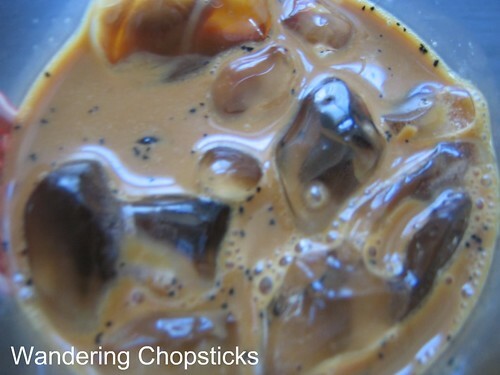 Pour the mixture over ice and you have ca phe sua da (Vietnamese milk coffee iced). Unlike automatic coffee makers, where the paper filters absorb much of the essential oils and grounds of coffee beans, a Vietnamese filter is less refined so the strong taste and high caffeine quotient comes through. And if you really love the taste of Vietnamese coffee, you can try using it in a batch of tiramisu like I did. Oh god, I love this! When I have a good schedule, I would make this almost every morning. I've got both of those coffee brands, but for the milk, I use the parrot brand (I guess it's because it's cheaper, haha). Damnit! 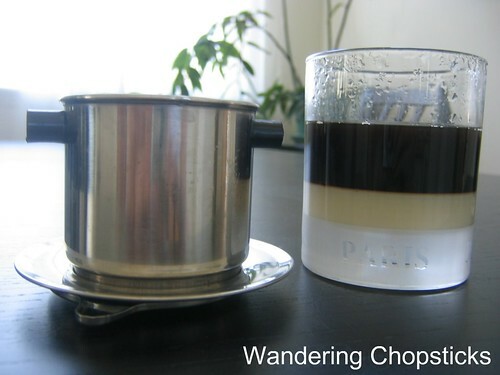 It looks so delicious, that I'm gonna have to make me some ca phe sua da right now. That is a beautiful thing WC. Beautiful! Ooh, that looks delicious! I really wish I still drank coffee, heh. I thing you should explore some of the VNese restaurants in the South Bay. Yeah, I think I bought mine right before my dad visited so he'd have his morning cuppa. Well, it's an occasional indulgence. I'm not much of a coffee drinker either. I love the taste but all that caffeine keeps me wired for days. I only order this Vietnamese coffee becos the drip is so interesting, but sometimes I find it too sweet for me. You can request the restaurant go light on the condensed milk if you don't like it. I drink Trung Nguyen brand coffee almost exclusively (except at work, where we get free Starbucks). Even then I have as old school drip system bequethed from my Mom (probably 20 years old and brought home from a trip to Vietnam) in a desk drawer at work just in case. In the land of coffee elitests here in the NW, I simply ignore the haters and their $15/lb gourmet roasts. The smell of a just-split cryovaced $4 container of Trung Nguyen seriously gives me an endorphin rush. I have a hard time keeping condensed milk around - I'm definitely lean light on the sweetness. 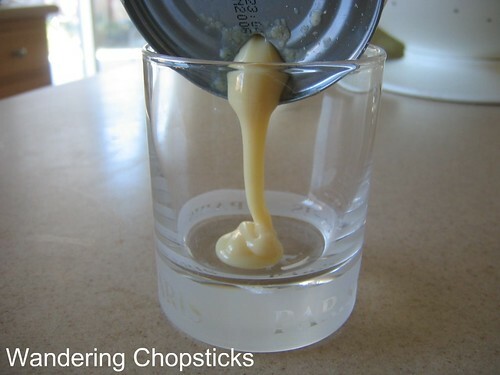 So usually 1/2 or more of a can of condensed milk simply rots. I think the first generation prefers it cloyingly sweet. Whenever my mom visits she makes my coffee so sweet I have a hard time breaking her heart by tellling her so - I'll just smile and then bring it to work and cut it. I wish they would sell it in small, self-serving sizes. My CA son-in-law loves the Viet. I just bought some sweetened condensed milk in a squeeze bottle. It's only milk and sugar, although it might be a little thinner than the canned stuff. This seems to be a relatively new packaging but I'm starting to see it in more and more places. Its got one of those one way valves like some of the newer katchup bottles so it might help with the spoilage problem that Guilty Carnivore (and others) may have. Its also a lot less messy. I don't remember where it was, but I did see the squeeze bottle. I think it was a Nestle brand. Can you help me out, I'm having a bit of trouble. I use about 2.5 tablespoons of coffee and screw the top filter on pretty snug with my fingers. When I pour the water in, it comes out too fast. This morning I tried again but this time I screwed it on very tight with the help of a butter knife and it dripped very slowly. I loosened the filter but to no avail, the grounds were too compressed. It came out good but took at least 10 minutes with about 1/5 of the water left. Any suggestions on how tight the filter should be? As snug as possible by hand or is there a magic number of turns? All the posts I read say it should be snug but not too tight. I've found if it isn't very tight it drips too fast. See my paragraph above about adding cold water to the filter to plump the grounds to slow down the dripping. Also, 10 minutes is OK for dripping time. Good luck! The optimal temperature to brew coffee is between 203-208 degrees. If you put 208 degree water in the Vietnemese coffee filter the water temp drops to 165 degrees (with the lid on) after 5 minutes. You say 10 minutes is ok for brewing time, however the longer you wait the cooler the water gets. I thought optimal brewing time is around 5 minutes for Vietnemese coffee. The problem is that to brew that fast the grounds have to be set too loose which results in a watery cup. Can anyone shed light on this dilema? I don't take the temperature of my coffee so I can't answer that. But as the coffee gets iced anyway, I don't have a problem with the temperature dropping. 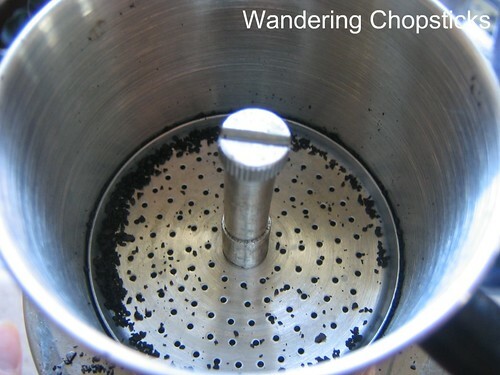 For slowing down brewing time, see my paragraph about pouring cold water into the filter first to get the grounds to swell up, thereby slowing down the dripping process. 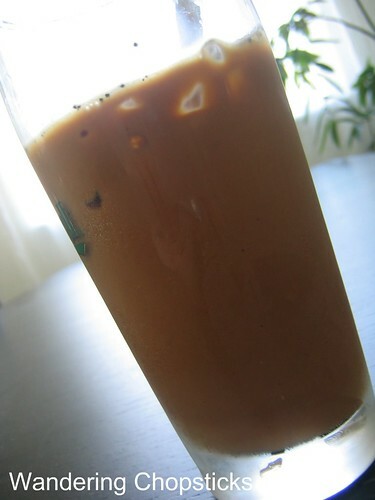 I do so enjoy a nice glass of ca phe sua da. I already have the press, I just need to get some coffee. I really miss living in San Diego and Orange County--asian stores EVERYWHERE! Colorado isn't so diverse :[ I have found some good pho and Japanese products, but it's just not the same. Thanks for the tips! Aw man. I totally know what you mean. I lived in Chicago for five years, and even though they had a VNese neighborhood, it just wasn't the same as SoCal. can i put your article in to my web? No you may not. My photos and writings are copyright and belong on my blog. You do not have my permission to republish any of my posts. I am having trouble brewing the coffee correctly. The result is either too dark and bitter or too light and watery. I don't have the screw-type filter, it's just a regular flat filter with holes. 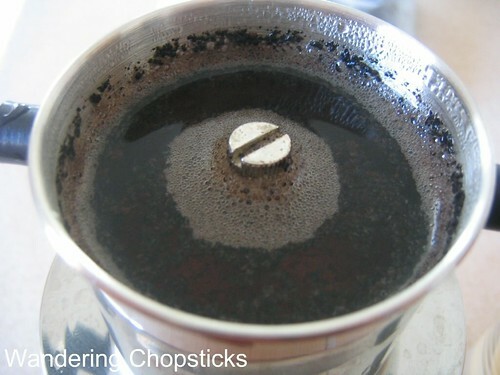 Can you tell me how I can brew a good cup of Ca Phe Sua Da using this type of filter? Thanks in advance! You need a screw filter so you can control the speed at which the hot water drips through the coffee grounds. A flat filter won't do that. You can try packing the grounds in tighter, but I don't know if that'll work. To Lala - a little late! That helps me know where the Vietnamese area is if I'm ever in Denver! Thanks!